Update: 05/01/2018 1:03 pm #KaufmanFire Personnel checked containment lines and found all lines secure and holding. Mop up and monitoring continues. All lines have held, no change in acreage. Mop up continues. Currently assigned Mountain Zone Engine 22, Salmon Challis 622, Juniper Valley Buena Vista. With the warm and windy forecast resources will remain on scene during the day. Fire is currently contained. Firefighters will work on the fire late into the night and will be back on scene early morning. Crews are currently strengthening the fire line and moping up the interior. Most county resources have been release except for the Water Tenders. Still have Forest Service engines and 20 person type II crew on scene. Aircraft is on hold at this time. Smoke is mostly coming from dead and down trees within the interior. Park County evacuations notice has been lifted. Resources: USFS personnel and Engines, Park and Chaffee County Cooperator Engines, Buena Vista JV crew and two SEATS. Fire is 100% contained. Due to better mapping, the size has reduced to 8 acres. Fire 50% contained at 1:30 PM. Currently three Forest Service Type 6 Engines and one Module on scene, along with Douglas County Resources. Highway 67 is now open to all traffic. 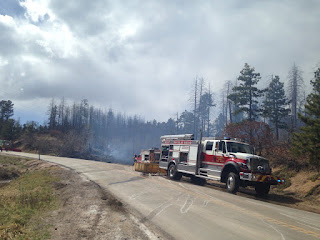 Motorists should use caution as fire personnel and equipment are still working near the highway. Highway 67 is closed to through traffic, except local residents and emergency personnel, 5 miles west of Sedalia at Oak Valley Road. The closure is necessary due to the high volume of emergency equipment and personnel working in the area. Fire held through the night and is still 11 acres in size. 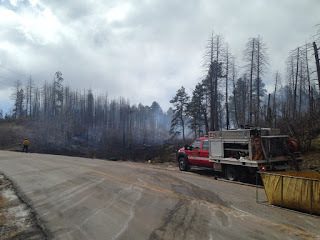 Resources: USFS personnel and Engines, Douglas County Cooperator Engines, Dozier and Helicopter. At one time there were 100 firefighters on scene. Some resources are being released, fire will be staffed with a night shift and will be staffing again tomorrow. There is dozier line and a hose lay around the whole fire. Location: Baca County, Comanche RD, Road R, SE of Springfield CO.